A great handout for your customers who love traveling, this two zippered fanny pack allows them to safely carry their personal belongings. 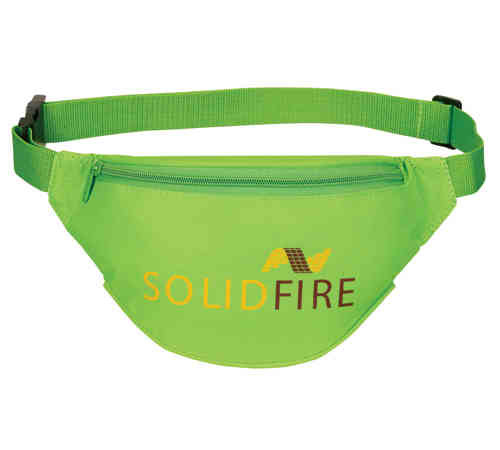 Made of 600 denier polyester with PVC backing, this crescent shaped fanny pack will carry all of your necessities and more while you enjoy your travels. Featuring an open zippered main compartment, one extra hidden rear zippered pocket and an adjustable waist belt, this 12"L x 6"W x 3"H will effectively market your business. Size: 12 " x 6 " x 3 "
Price Includes:one color and one location silk-screened imprint.